This entry was posted in Luxury Travel Company, News on November 8, 2013 by Richard Parks. 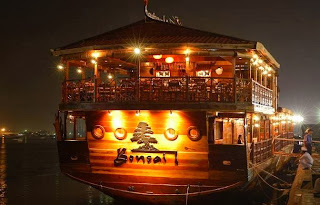 We nine friends finalized ‘’Bonsai Dinner Cruise on Saigon River with the ‘Luxury Travels’ in Ho Chi Ming City in Oct. 2013. The booking included hotel pick-up & drop. We found the Luxury Travel to be a very reliable Company having rich experienced in organizing tourism. We enjoyed the 2 hours cruise on the Dragon boat with gastronomic moment, soft and classic music; singing, band, traditional dances displaying rich culture of Vietnam. The high-light of the evening was the Magic Show; we were thoroughly entertained by Mr. Hun’g the Magician showing incredible tricks with unbelievable acumen & amusing showmanship. I’m sure with his huge bundle of tricks he is an indispensable asset for the Cruise Company. I’m compelled to visit the ship again just to enjoy the magic show performed by Mr. Hun’g. I must mention the excellent service by Miss Ye’n; she deserves the Master’s Degree in Hospitality; charming Ye’n’s sole objective was to satisfy all our needs, always ready, attentive, smiling, capable, responsible & a sincere hostess. While on board, we visited to upper deck for panoramic view of the city lights. For ultimate relaxation Cruise also offers complimentary Back-massage. We admired the lacquer wooden boat offering great spread of buffet including variety of sea-food, sweet dishes & also delicious vegetarian dishes. We are very happy to engage the services of Luxury Travel Company which was very much worth it. With memorable dining & entertainment spectacle along the Saigon River, The Luxury Travel Company made our evening in Ho Chi Minh really unforgettable & beyond our expectation. This entry was posted in Luxury Travel Company, News on October 29, 2013 by Richard Parks. Vietnam-based Luxury Travel (http://www.luxurytravels.asia/) is attending both WTM and ILTM to promote luxury travel products at World Travel Market London 2013 (WTM) from November 4 to 7. This year, Luxury Travel has expanded the size of its stand which will be located just in front of the Vietnam Tourism Board and Vietnam Airlines stand. Luxury Travel is attending both WTM and A Taste of Luxury at ILTM,is an official supporter of World Responsible Day at WTM and has launched several new responsible tours. According to Pham Ha, founder of Luxury Travel, the UK has been a great market for the company, whose products appeal to British tastes and preferences, particularly tailor-made tours and the two set departure tours on offer. The company enjoyed over 200% growth from the UK in the first 9 month of 2013, compared with the same period last year, partly because of favourable exchange rates. Luxury Travel has increased the number of private small groups that it served, primarily with tailor-made holidays. Luxury travel is not just about limos and five-star hotels, but creating memorable experiences and Luxury Travel ensure that its guests feel part of the place rather than a casual observer, the authentic experience being particularly popular with visitors from Britain. Getting off-the-beaten track, relaxing on the beach at less visited places such as Con Dao and Phu Quoc as well as combining Vietnam with visits to Cambodia, Laos or Myanmar are great favourites with the UK market. Vietnam is appealing to British visitors because of it’s safety, affordable prices, authenticity, lovely weather and convenient direct flights with Vietnam Airlines. The past few years have seen the completion of many luxurious resorts such as Hyatt Regency Danang Resort and Spa, Intercontinental Peninsula Danang Sun Spa and Six Senses Con Dao and the increased choice and deluxe brands have proved a great hit with the British. This entry was posted in Luxury Travel Company, News on October 28, 2013 by Richard Parks. 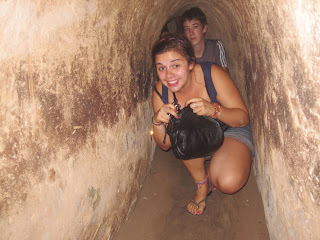 The Cu Chi Tunnels is a favorite tourist site for many international travelers. I have been few times, and each time, I return with a new story, discover a lesser known point of interest, and find a new way to experience the Saigon River and Cu Chi via its waterways. One of Vietnam’s most famous war memorials the, Cu Chi Tunnels is where visitors come to experience what life was like for revolutionary soldiers fighting in the jungle. The tunnels allowed the Vietnamese guerillas to control a large rural area only 30 to 40km from the former Sài gòn. At its height, the tunnel system stretched from the economic hub to the Cambodian border. All travelers go by road to Cu Chi, we will take a half day excursion by waterway to the famous tunnels, which stretched for over 200 km and became legendary during the 1960s when they played a vital part in the American War. My friend Nhan and I had trouble deciding between a morning and afternoon trip, but we opted finally to take the tour in the morning. At 8 am, we joined 8 people with our tour guide on the waterway journey from Bach Dang Pier in HCM City to the Cu Chi Tunnels on Sunday. The new way to visit the tunnels is very convenient, taking just 1 hour and 15 minutes to get from Ho Chi Minh City, with NO traffic jams! You can admire the perspective of the HCMC skyline as you cruise upstream on the new yacht. Binh Duong Province is on the right hand side and Ho Chi Minh City on the left as we cruise up the frontier and I am always amazed that just a few minutes from Bustling Saigon, there lies a peaceful countryside and amazing life in the world of water. That is why I understand why Vietnam is the country of “Dat Nuoc” (land and water). The yacht cruise is a new development on Saigon River, as local business seeks to develop new products to attract travelers to HCMC and encourage them to stay longer. Our yacht was new and comfortable, and had an on board toilet. The uniformed captain welcomed us on board with a smile, and we had a safe feeling on our river adventure. Our guide Chung was a friendly young lady (like most Vietnamese women), and she served us fresh water and fruits. With her excellent English, she guided everyone through the safety regulations and overview of the trip. We were also informed that the favorite trips are Saigon – My Tho and Ben Tre in the Mekong Delta, and Saigon to the Can Gio biosphere and to Cu Chi Tunnels. Other tours include cruises from Saigon to Siem Reap, Cambodia or you may go the reverse way. Chung explained that many businessmen prefer the privacy of the cruise, as well as a sunset cocktail or dinner aboard ship. After some conversations with the tour guide and tour members, we arrived at the Ben Dinh Pier near the Cu Chi Tunnels. Then we stepped into a jungle of banyan trees and took a short walk to the iron triangle of Cu Chi. We had plenty of time to explore the tunnel system and watch a video about them, which included commentary from former soldiers to help visitors better understand the history. There are two sections of tunnels to open visitors, at Ben Duoc and Ben Dinh. The latter are in original condition, while the Ben Duoc tunnels have been recreated for tourists and visitors. The network, parts of which were several levels deep, included innumerable trap doors, specially constructed living areas, storage facilities, weapons factories, field hospitals, command centres and kitchens. Also, an impressive temple was built to honor martyrs at Ben Duoc. Upon request, travelers can meet living Viet Cong veterans, many of whom are ready and willing to tell their stories to the world. Yet on the surface, Cu Chi is like every other rural district in Vietnam. Women chat over mounds of vegetables at the local market. Young men lounge in the dusty open fronted restaurant. Today, it is hard to believe that this area, part of which is just 30 km far from downtown Ho Chi Minh city, occupies some of the most heavily bombed land in the history of warfare. This area was a “free bombing” zone, which allowed the US army to bomb at any time and anywhere they suspected enemy activity. The secret of the Cu Chi lies underground. Beginning in the late 1940s, resistance fighters dug a series of tunnels into the rust colored earth of Cu Chi to allow them to evade French army patrols. The old tunnel network was renewed and enlarged when the National Liberation Front (NLF) insurgency began around 1960. “Visiting the Cu Chi Tunnels was a memorable experience. In the pouring rain, we walked around the site where battles were fought and so many lives were lost. forget.” a tour member told to me after the trip. Also as part of the tour, we arrived at Bach Dang, in time for lunch, and we walked to the impressive bonsai garden (Vuon Kieng) on the bank of Saigon River. As all the tourists headed back to the city and their next adventure, they all agreed that a tour of this area is a “must do” for anyone visiting Vietnam. We are happy to help others experience this unique destination. This article is copywrited and provided by Mr. Pham Ha who is an award-winning CEO and founder of Luxury Travel Ltd (www.luxurytravels.asia), the first luxury travel and tour operator in the Mekong region. He is also a travel guru, tourism speaker, travel writer, consultant and a leading designer of luxury tourism industry training programs. This entry was posted in Luxury Travel Company, News on October 4, 2013 by Richard Parks. The beach town of Nha Trang is popular beach heaven for holidaymakers, and now you head north (1.5hour from Cam Ranh Airport) to Vinh Hy Bay for the new Amanoi, the latest property by the uber-luxurious Aman Resorts. Tucked away in a national park, Amanoi–opened in September 2013 –sprawls within 100 acres of the lush and vibrant landscape, comprising hilltops, coastlines and a very private beach. In this tranquil oasis, the air is fresh, breathtaking views abound and the feeling of being far from home is ever present.The resort’s design feels more like a gracious, private residence rather than a hotel. Staff is personable (and treats you like a house guest), centuries-old antiques and contemporary furnishings adorn public spaces and the 31 individual guest pavilions and five villas are strategically set throughout the forest, ensuring plenty of privacy and space. All pavilions are equipped with king-size bed, sofa, writing desk, LCD TV, wireless Internet and sound-docking systems. Bathrooms feature stand-alone bathtubs with separate rain showers and priceless views of the bay or forestry through floor-to-ceiling windows. Most pavilions also include a large, private timber deck with pool and sun beds. The 20,000-square-foot spa is situated next to a calming, lotus-filled lake anchored by a yoga pavilion, and the fitness center is equipped with state-of-the-art equipment, in addition to a Pilates studio. Some guests, however, just want to unwind, and the perfect setting is the Beach Club, comprising an outdoor restaurant, an infinity pool and a stretch of white-sand beach flanked by million-year-old rock formations. The turquoise water shimmers, and guests have the option to snorkel, kayak or take out a Hobie Cat. There’s also an outdoor pool by the Main Pavilion, with a restaurant serving Vietnamese and Western fare. 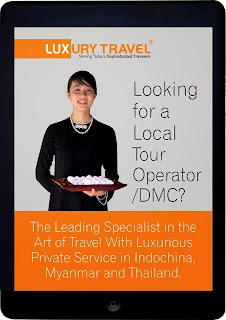 International Trading Name in English: LUXURY TRAVEL CO., LTD. This entry was posted in Luxury Travel Company, News on October 3, 2013 by Richard Parks.